The Chapultepec is perfect If you like to be in the centre of all the action. Right in the heart of the Guadalajara's cultural quarter, the hottest bars, restaurants, cafes and clubs are all just a short walk away. With a great selection of tours and activities on offer (as well as free bike rental! ), the staff will make sure that getting orientated with the city is simple and fun. According to one past guest, 'the whole place makes you feel at home' - a spacious garden kitted out with a BBQ grill and hammocks makes it super easy to make new friends. You won't be disappointed. We proudly received the prestigious Hoscar of Hostelworld.com as the best hostel in Mexico 2014! Also winners of the Certificate of Excellence 2013-2017 by Tripadvisor. Lonely Planet, the World's most trusted travel guide, only recommends 2 hostels in Guadalajara: Hospedarte Chapultepec & Hospedarte Guadalajara Centro HI Hostels! We are your RELIABLE choice in Guadalajara! 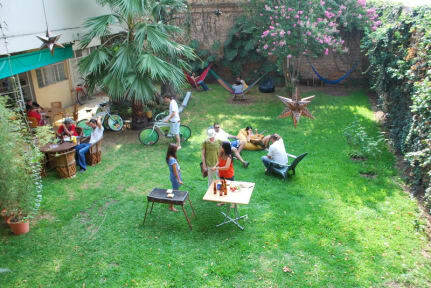 Great location, next to an amazing taco place (attached to hostel) and near the lively streets of Guadalajara. Was loud, was a sat night. People partied til 5am. But genuinely kind staff. This is a great place to stay. It has a great outdoor space, with being very close to a good downtown area with plenty of restaurants and bars. The staff were great with recommendations of things to do in the area and helpful with anything around the hostel. Would definitely stay again and highly recommend to any travelers! A cozy hostel, I felt very welcomed and the staff was super nice. The atmosphere is great, especially at the hostel bar. I would stay there again for sure. I have been to Guadalajara 3 times. Hospedarte Chapultepec is the best hostel in town. And, they don’t pay me to say that. The shower is super ****ing hot. The dorm beds are comfortable and tall enough to sit all the way up. The garden is nice in the morning and the evening. Chapultepec Avenue is a 5 minute walk with loads of food and drink options. This hostel boasts a pub crawl, an in house chef, a bi lingual staff plus a taqueria and a ramen house right next door. Can’t beat it IMO. Super hot showers and clean bathrooms. The best part was the staff — really welcoming, friendly and so so helpful. Took care of me when I had food poisoning and are all just really lovely people. Ended up staying here for 7 nights instead of the 2 that I intended. My boyfriend and I had a very good experience at this hostel. We had a private room with ensuite bathroom, and it truly felt like I was in a nice hotel. The hostel workers were very nice and helpful, and fun to hangout with as well! Trendy restaurants and bars are within walking distance, and it’s very safe. The only bad part of our stay was that there was no shower curtain in our bathroom and we had to wait till the next day to shower, but the employees were as helpful as they could be. The location is good if you like bars/restaurants but i woul rather stay in the center of city to see beautiful historic Guadalajara. the outside yard is beautiful with hammocks. Breakfast was good. Staff is nice especially cleaning staff. if you're looking to get a private room for privacy look elsewhere. private room setup is not ideal. one of the walls is made of think window glass with little to no privacy aside from thin curtains. As far as hostels go it isn’t amazing, not that much of a vibe in terms of meeting other travellers, I think because there are lots of private rooms. location is great however, Chapultepec is so much fun and there are so many cool cafes, restaurants and shops in the area. Definitely do the walking tour and the wrestling on Tuesday they were both lots of fun and that’s where you got to actually meet other people. The doorm rooms are fine but don’t feel very secure, door is constantly open.